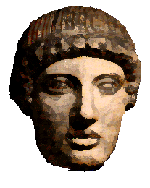 Plato was an Athenian, an aristocrat, connected with the ancient royal family. He was born in 428 BC and grew up during the Peloponnesian War (431 BC - 404 BC). His experience of politics was thus not of Pericles, but of the demagogues like Cleon and Hyperbolus. Several of his relatives were involved in anti-democratic politics, especially Critias, his uncle, who was one of the Spartan-appointed "thirty tyrants" after Athens lost the war. Plato himself was not a supporter of democracy and admired the more organised constitution of Sparta. The final straw was when Socrates, whom Plato admired immensely for his teaching and way of life, was executed in 399 BC - at the age of 70 - for "corrupting the youth" (i.e. encouraging them to criticise what they were taught, and to think for themselves). He left Athens and visited Libya (for mathematicians) Egypt (for prophets and mystics), Italy (the Pythagoreans) and Sicily (where, as tutor to the royal family, he failed to put his ideas into practice: he was sold as a slave - but was freed by a Libyan friend who also gave him money to buy some land back in Athens).